The Weld Valley remains one of the most diverse areas of native ecology in southern Tasmania. The Weld sits at the frontier of Europe’s “ecological empire”, between the ancient rhythms/landscapes of the western wilderness and the graduallty expanding radius of white settlement. Today indiustrial forestry pushes into the virgin forests of the lower Weld, while its headwaters, beneath Mt Anne, are protected in the Tasmanina South West WildernessWorld Heritage Area. Such an anomalos situation represents the mixed intentions of Governments past and present. In fact, it conveys a sense of that deep uncertainty at the heart of Tasmanian culture about the value of our own wild places, about our relationship with the lanscapes that surround us. For just over a year, Camp Weld, home of the Weld Ark , has been the focal point of protest action to save this diverse, primeval forest from clearfell logging by Forestry Tasmania. 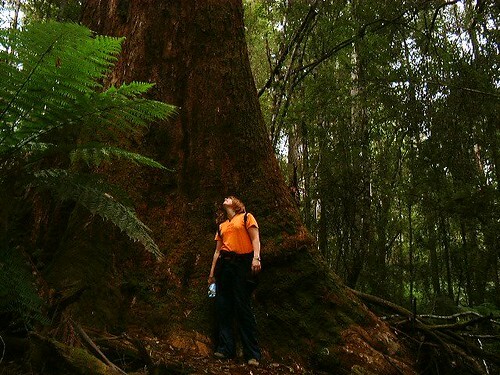 This tree-sit and village were built at the end of Forestry Tasmania’s logging road and stopped its construction deeper into the old growth sections of the valley that have been earmarked for clearfelling. On November 15th, 2006, things turned bad and Camp Weld was disbanded by Tasmania Police officers. Resident campaigners had no time to collect their personal belongings before the Weld Ark was demolished and the dozers moved in to continue the road’s construction. Although there have been about 30 arrests so far, Weld Valley supporters are maintaining their action to help save the ancient forests of this beautiful place. Activists at the Huon Valley Environment Centre have produced a series of short films documenting the Weld Forest, Camp Weld and the destruction of the Weld Ark. Here is a link. The video runs for an hour, and to watch it youÃ¢â‚¬â„¢ll need at least 800kbps link speed and Quicktime 7. A more detailed article outlining the recent history of forest practices in Tasmania was written earlier this year by djehuty. For the latest updates on the Weld protest and other information, visit Weld Valley Online, or savetheweld. Visit melbourne indymedia to see images and video of protest action and arrests.